The transporters and the authorities of the City of Santiago de Querétaro (Mexico) agreed to modernize the public transport by means of the incorporation of forefront technologies for the tariff collection, the income distribution and for the service operation control. All this also with the aim to begin the integration of an efficient and profitable system of public transport. 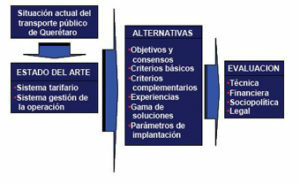 PalmaTools, together with the consulting Mexican USTRAN, elaborated the technical studies and initial specifications to transform the system of ticketing existing (minimally automated, and with scanty management of the information) in a modern ticketing system with centralized information, by means of the migration to a contactless ticketing system with the forecast of the implementation of a SAE also centralized system. In addition, inside the project one of the objective was the administrative and juridical study for the creation of a managing transport entity like a transport consortium. – Real time knowledge on the part of the users of the functioning of the service, so much inside the unit, since in the principal stops of the corridor. – To adapt the human and material resources to the needs of transport of the network. – To optimize the human resources assignment. – To create a permanent channel of internal communication. – To know any incident inside the buses. – To implant an emergency system that will improve notably the drivers safety. 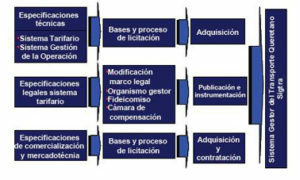 The scopes of the study established as aim to define the technical, juridical and administrative characteristics of an electronic prepayment system, of a centralized collection and of the operation control in order to allow the quality improvement of the public transport service and simultaneously to offer more safety to the users and to preserve the concessionaires profitability. – Diagnosis of the current situation: in relation to the toll system, to the some operators SAE system, to the tariff existing system. – The technical specifications of the equipment were elaborated to install them in the bus and in the central system, both for the system of toll and for the SAE, an offer was done for the implementation of new titles of transport in contactless support and there was done an administrative and juridical study in relation to the creation to the managing Entity of the transport.